Looking for indoor family fun? 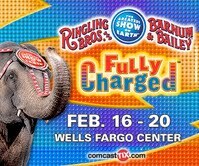 Don’t miss Fully ChargedSM, by Ringling Bros. and Barnum & Bailey® where there are non-stop thrills in every corner of the arena for kids of all ages! If you decide to go, you should read this post from Birmingham Mom called Big Top Tips on Going to the Circus. She tells you all about purchasing tickets, meeting clowns before the show, and other tips for a smooth experience. If the circus isn't coming to your town, but you still want to share the excitement, you can enjoy some circus-themed online activities in the Fun Zone. There are so many cool activities, including: Desktop Train, Pie-o-Gram, Clown Cannon and Create your own Circus. I know my 5 year old will love these!